Skin cancer is a condition of uncontrolled growth of cells in one or more layers of the skin. It is the most common form of cancer in the United States. They are so common that almost everyone will have some form of skin cancer sometime during the course of their life. The younger the age at which the first one is identified the greater the risk that you will have multiple skin cancers over the course of your life. The primary cause is prolonged and/or intermittent overexposure to ultraviolet radiation from the sun. Therefore most of these skin cancers appear on parts of the body unprotected from/exposed to the sun such as the face, ears or nose. Factors that increase one’s risk for basal cell cancer include sun exposure (it is frequently seen in surfers, outdoor construction workers…), light complexion, radiation therapy to the skin, immunosuppresive therapy after organ transplantation, exposure to arsenic insecticides & a congenital disease called xeroderma pigmentosum. Cells damaged by sun exposure may take 20 or more years to visibly manifest themselves as basal cell cancers. Thus, it can be hard to distinguish between a new & a recurrent basal cell cancer. It is important to treat basal cell carcinoma as soon as their are diagnosed because although they do not metastasize they slowly grow and eat their way into local tissues including bone. They can become highly destructive so that what would otherwise be a simple procedure under local anesthesia becomes a major operation under general anesthesia with associated morbidity. In this case as in most such cases the treatment was surgical removal of the basal cell carcinoma, closure of the resulting wound by advancing local tissue and confirmation of complete basal cell carcinoma removal by examination of the removed tissue by a pathologist. The reason to see a plastic surgeon is to get complete removal and closure of the defect through surgical techniques that yield the best cosmetic result without functional deficit. Usually that means surgical manipulation of adjacent tissue rather than skin grafting or too tight a closure that causes other problems. Removal of skin cancers from the nose is challenging because there is frequently insufficient skin laxity to allow simple closure of the resulting wound. In this patient the desired result is scars within natural boundaries of the nose, intact nasal outlines, patent nostrils without deformation on breathing and coverage of the defect with skin that is closest in character to normal nasal skin. 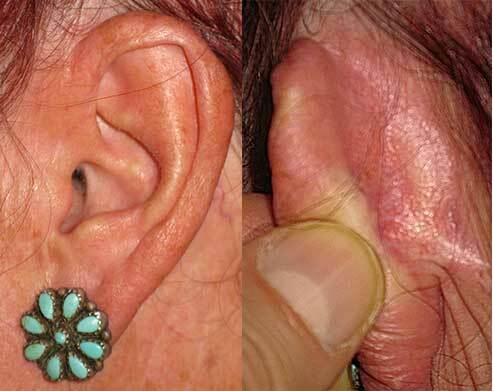 This basal cell carcinoma on the ear was removed and a rectangle of skin advanced to close the hole. The 2 triangles at the base of the rectangle are removed so the skin can be advanced. The lower photos show the end result at 1 year after surgery. Excision of fungating basal cell carcinoma of the nose with removal of all of the nasal bridge skin and staged reconstruction with a flap of skin from the forehead. The most common method employed by dermatologists to treat basal cell carcinoma is currettage(scraping). The cancer is scraped until all the softer cancer tissue is removed. Other non surgical methods available are topical 5-FU cream or Imiquimod or oral Erivedge. Imiquimod has to be applied 5 times a week for 6 weeks and leaves the patient with a wound that looks worse than the cancer. It can take up to 12 weeks for the wound to heal. Erivedge is a prescription medicine used to treat adults with basal cell carcinoma, that has spread to other parts of the body or that has come back after surgery or that cannot be treated with surgery or radiation. Both Imiquimod and Erivedge are more expensive than simple surgery and are only covered by health insurance in specific cases. Radiation therapy is also used but is mostly reserved for older patients who cannot tolerate surgery or have cancers in areas that cannot be excised. cell carcinomas of the skin. They are not predictors of any other type of cancer. It is important that you wear strong sun screen anywhere you have had these skin cancers & all areas exposed to the sun. As with any type of surgery there is the risk of infection or bleeding. If flaps are used to close the excision site there is a risk of partial or complete death of the skin in the flap. Closure of the excision sites can also result in temporary or permanent distortion of adjacent structures. If skin grafts are used they may have a different color and textures than the surrounding native skin. The benefits of early treatment are minimization of the disfigurement that arises with these cancers. The recovery is dependent on the surgery employed, if any. For skin graft closure there is generally 2 weeks of immobilization of the treated area. For flaps there may or may not be immobilization. Regardless of the surgery most patients are back to their usually life in 2 to 3 weeks especially if treated early.